JMRI supports the SPROG both as a Decoder Programmer, and as a mini-Command Station. For more information on these capabilities, see the SPROG manual on the SPROG web site. Note that there are several different versions of the SPROG hardware, and even more versions of the SPROG software. Original SPROGs were connected via a 9-pin serial cable. Current SPROGs are available as USB only. Connect your SPROG using the appropriate cable and power it up. If you previously installed some special USB driver, uninstall it on Windows 10 before proceeding. On Windows 7 and earlier users may need to have a driver installed. For more information on that, see the SPROG manual on the SPROG web site. Windows 7 users may also be interested in this video. On macOS no USB drivers for SPROG need to be installed to use the SPROG IIv3, SPROG IIv4, SPROG3 or SPROG Nano. They comply to USB CDC (Communications Class Device) and use the default drivers included with macOS. For Linux, there are many variations of Linux system installations, and variations in installing the USB support may be encountered, but in general USB CDC devices are supported directly. Make sure you have the latest version of JMRI. Start one of the JMRI applications. Go to the Connections tab of the JMRI Preferences pane. This opens automatically the first time a program is run, or you can select it from the "Edit" menu. Select "SPROG DCC" from the list as the System Manufacturer. SPROG can either function as a stand-alone Decoder Programmer interface, or it can be set to act as a mini-Command Station for running trains. Once you select and save your choice, JMRI configures the necessary options in the SPROG. If both of the left hand fields display in red type, you may have selected the wrong SPROG System Connection. 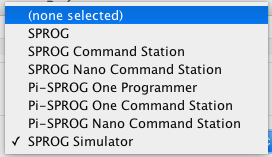 For Command Station operation, select one of the "... Command Station" choices. 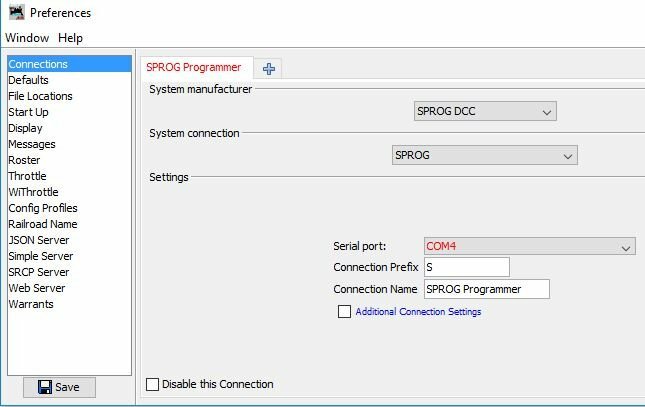 To use JMRI without a physical SPROG connected, select "SPROG Simulator". The Simulator will mimic basic operation as either a Programmer (default) or a Command Station. You can set the mode under Additional Connection Settings. Next, under Settings select the appropriate serial port, except for the Simulator. Note that the USB SPROG drivers will appear in the list as a serial port, like cu.usbmodem1411. Click "Save". You'll be asked if it's OK for the program to restart, click "Restart" or "Later". After restart of JMRI you should be up and running with the new connection. SPROG uses a "Mode Word" to set a number of optional operating modes. Open the Command Monitor and the Send Command tools from the SPROG menu. Send an "M" command using the Send Command pane. The h prefix indicates a hexadecimal value. If the value you see is different, then it should be changed by sending the command "M h800". Follow this with the command "W" to save the change in SPROG's EEPROM memory so that it is effective each time you power up the SPROG. Otherwise, the new value will be lost when you power off the SPROG. Please do not be tempted to experiment with other Mode Word values as this could result in erratic behavior of your SPROG. Open the SPROG Console tool pane from the SPROG menu and send a "?" command. 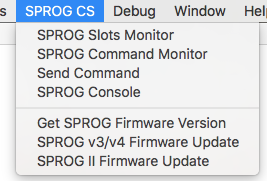 SPROG includes a "Firmware Update" tool that allows the SPROG firmware (the internal software that operates the SPROG) to be updated by the user. The update tool. For more information on the SPROG, see the SPROG web site. They have a useful FAQ page. There's a SPROG Yahoo group. A Dutch-language SPROG Beginner's Manual is available as a PDF from Domburg Train Support.